This evening’s Express & Star letters page featured a real gem, and unusually for the paper, they’d actually awarded this sensible communique ‘Letter of the day’ – an award normally reserved for the dribbling ramblings of various ranters whose output tends to be so right wing, it would embarrass Mussolini himself. It’s a cracking letter about the demise of Brownhills Market, as seen from the perspective of a trader. The traders – as you’ll no doubt remember – were recently branded ‘selfish’ by Walsall cabinet member for regeneration, Councillor Adrian Andrew, for the crime of taking their wares to a place where there were real customers and a functioning market. 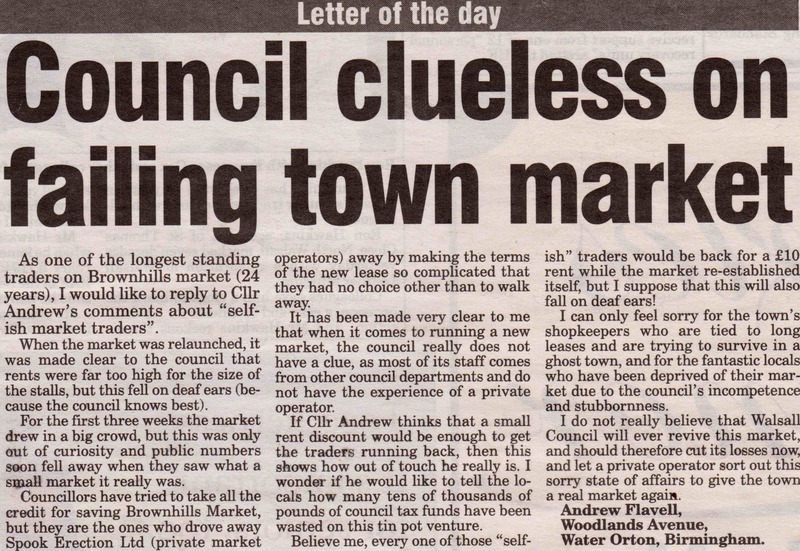 Perhaps Mr. Andrew might like to reflect on the views of the traders, and cease the revisionist nonsense Walsall Council keeps spouting about ‘stepping in to save Brownhills Market’. It is certainly beginning to look as if the council’s incompetence, dithering and desperate desire to over-monetise has killed it. Well done, chaps – if one of you is last to leave, please switch the lights off. If you’re reading this, Mr. Flavell, please get in touch, I’d be interested to chat with you. That’s brownhillsbob at googlemail dot com. Cheers. As one of the longest standing traders on Brownhills market (24 years), I would like to reply to Cllr Andrew’s comments about “selfish market traders” . When the market was relaunched, it was made clear to the council that rents were far too high for the size of the stalls, but this fell on deaf ears (because the council kows best). For the first three weeks the market drew in a big crowd, but this was only out of curiosity and public numbers soon fell away when they saw what a small market it really was. Councillors have tried to take all the credit for saving Brownhills Market, but they are the ones who drove away Spook Erection Ltd (private market operators) away by making the terms of the new lease so complicated that they had no choice other than to walk away. It has been made very clear to me that when it comes to running a new market, the council really does not have a clue, as most of its staff comes from other council departments and do not have the experience of a private operator. If Cllr Andrew thinks that a small rent discount would be enough to get the traders running back, then this shows how out of touch he really is. I wonder if he would like to tell the locals how many tens of thousands of pounds of council tax funds have been wasted on this tin pot venture. Believe me, every one of those “selfish” traders would be back for a £10 rent while the market re-established itself, but I suppose that this will also fall on deaf ears! I can only feel sorry for the town’s shopkeepers who are tied to long leases and are trying to survive in a ghost town, and for the fantastic locals who have been deprived of their market due to the council’s incompetence . and stubbornness. I do not really believe that Walsall Council will ever revive this market, and should therefore cut its losses now, and let a private operator sort out this sorry state of affairs to give the town a real market again. This entry was posted in Brownhills stuff, Environment, Express & Star, Followups, It makes me mad!, Just plain daft, Local media, Local politics, Shared media, Walsall Council and tagged Adrian Andrew, Andrew Flavell, Brownhills, Brownhills Market, Express & Star, Express & Star letters, Letter of the day, Local politics, Walsall, Walsall Council, Walsall politics. Bookmark the permalink. Great to see Capatain Cluless’ cronies advertising their ignorance again. Surely Adrian Andrew, as a practising tory, has come across ‘market forces’ (no pun intended)? This is the basic economic tenet much loved by proper, heavy-duty tories that says the market (again, npi) will determine the levels of supply, demand and prices. Now, moving away from purist theory, tinkering with market mechanisms is traditionally the realm of either labour administrations in the UK or command economies behind the now-defunct iron curtain. market for a market by fiddling with prices and supply, or by playing at demand management? Those sound suspiciously like labour party (old labour, at that…) tactics. Is Councillor Adrian suffering a crisis of faith, or does he just not have a clue what he is talking about? How many empty pitches are there on the market ? The fact is that markets and small shops are dying throughout the UK. In Leeds here we have probably Britain’s most famous market, Marks & Spencers started there with a trestle table stall, todays it’s a ghost-town and there are so many boarded up stalls it now looks like a wood yard. The main cause for this are [a] high stall holder rents [b] high service charges [c] no parking close by [d] at least 6 traffic wardens waiting patrolling the streets waiting to pounce on parking overstayers [e] the unstoppable growth of giant out-of-town-shopping centres and supermarkets, and [f, a strange reason]: People have too much money to spend and no longer hunt for bargains like their parents once did, they now want designer goods from designer shops so that they can be part of the up-market in-crowd. Market goods never were fashionable, so for these reasons street markets are very much a dying trade. I mentioned high rents, in Leeds the council want £350.00 per week for a good stall, £300.00 service charge, and expect you to sign a 3-5 year lease. They turn down reasonable rent offers like £200.00 pw. What they don’t admit is they want to see the market closed, demolished and turned into a car park for 1000 cars, today that’s were the money is – not running town markets. Did someone mention sentiment? the only sentiment you’ll see today in local government is they’ll allow you to 7 days to pay a £40.00 parking fine for being 10 minutes late getting back to your car.